Stan Lee, the legendary writer, editor and publisher of Marvel, died on November 12, 2018, at the age of 95 in Los Angeles, a family representative told The Hollywood Reporter. Stanley Martin Lieber was born in Manhattan on Dec. 28, 1922 to Romanian-born Jewish immigrants, and started at Timely Comics in 1939, creating or co-creating the Destroyer, Spider-Man, Black Panther, Iron Man, the Incredible Hulk, the Mighty Thor, Dr. Strange, Ant-Man, the X-Men, Daredevil and the Fantastic Four, among numerous other figures. Timely, by the 1960s, would evolve into Marvel Comics. He took a break from the comics scene to write manuals and scripts for training films while serving in the U.S. Army during World War II. He achieved the rank of sergeant. 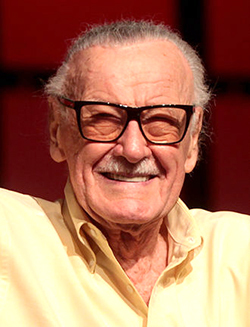 Following his retirement from Marvel, he remained a public figurehead for the company, and frequently made cameo appearances in movies based on Marvel characters. Meanwhile, he continued independent creative ventures into his 90s until his death in 2018. Lee was inducted into the comic book industry’s Will Eisner Award Hall of Fame in 1994 and the Jack Kirby Hall of Fame in 1995. He received a National Medal of Arts in 2008. He is survived by a daughter, Joan Celia “J. C.” Lee, and his younger brother Larry Lieber, a writer and an artist for Marvel. On July 6, 2017, his wife of 69 years, Joan, a hat model whom he had met in 1947, died of complications from a stroke. She was 95 years old.